Price Range £134 - £135Price RangeSimply drag the slider bar to set your price range. 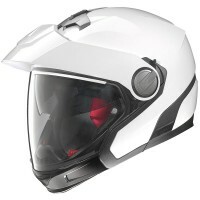 The N40 Full is a crossover helmet by Nolan that continues the legacy of the N43E Air. Thanks to the wide range of standard equipment, including chin guard and peak, this helmet is perfect for the city but also ideal for out of town touring. The helmet is both P & J homologated which means the removable protective chin guard, complete with air intake, has passed the tests required by ECE regulations for full-face helmets. In addition to the outstanding standard features (AirBooster Technology, VPS sunscreen with 6-notch adjustment system, extra-wide visor...), the lining has also been designed to offer a greater level of comfort, even over long distances. The chin strap has been integrated into the inner padding, ensuring an easier fit in full-face configuration. Because of its width, this ensures that the padding fits tightly around the neck. The Microlock retention system and set up for the N-Com communication system complete the product.